Um Balqees Dental Clinic which is famous and state-of-the-art facilities equipped Dental Clinic in Sultanate of Oman. This Clinic is situated in Ibra City. This clinic is having a lot of specialized treatment like Single Sitting Root Canal Treatment, Impactions (Third Molar Surgery), Full mouth flap surgery for gum problems, porcelain veneering, Frenectomy etc. Recently, Mr Hareesh contacted us and informed that there is vacancies for Pharmacists in Pharmacy that is situated near to the Dental Clinic. The pharmacy is one of the biggest and well standardized pharmacy in Sultanate of Oman. 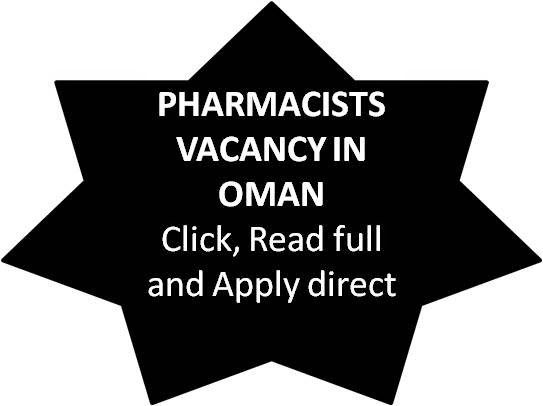 Pharmacists with 3 year experience are required.WITH or WITHOUT licence. OMSB prometric is preferred. Salary and other details, please discuss direct with management. Please send your CV directly to the management. the contact address as per the website is given below. Hurry, limited time, Apply direct, No agency, No third person.